This article contains Tibetan script. Without proper rendering support, you may see very small fonts, misplaced vowels or missing conjunctsinstead of Tibetan characters. The Mekong is a trans-boundary river in Southeast Asia. It is the world's twelfth longest river  and the seventh longest in Asia. Its estimated length is 4,350 km (2,703 mi),  and it drains an area of 795,000 km2 (307,000 sq mi), discharging 475 km3 (114 cu mi) of water annually. From the Tibetan Plateau the river runs through China's Yunnan Province, Myanmar, Laos, Thailand, Cambodia, and Vietnam. 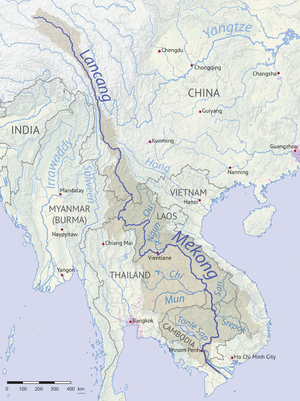 In 1995, Laos, Thailand, Cambodia, and Vietnam established the Mekong River Commission (MRC) to manage and coordinate use of the Mekong's resources. In 1996 China and Myanmar became "dialogue partners" of the MRC and the six countries now work together in a cooperative framework. The Tibetan Plateau, also known in China as the Qinghai–Tibet Plateau or the Qing–Zang Plateau or Himalayan Plateau, is a vast elevated plateau in Central Asia and East Asia, covering most of the Tibet Autonomous Region and Qinghai in western China, as well as Ladakh and Lahaul & Spiti in India. It stretches approximately 1,000 kilometres (620 mi) north to south and 2,500 kilometres (1,600 mi) east to west. With an average elevation exceeding 4,500 metres (14,800 ft), the Tibetan Plateau is sometimes called "the Roof of the World" because it stands over 3 miles (4.8 km) above sea level and is surrounded by imposing mountain ranges that harbor the world's two highest summits, Mount Everest and K2, and is the world's highest and largest plateau, with an area of 2,500,000 square kilometres (970,000 sq mi). Sometimes termed the Third Pole, the Tibetan Plateau contains the headwaters of the drainage basins of most of the streams in surrounding regions. Its tens of thousands of glaciers and other geographical and ecological features serve as a "water tower" storing water and maintaining flow. The impact of global warming on the Tibetan Plateau is of intense scientific interest. A waterfall is an area where water flows over a vertical drop or a series of steep drops in the course of a stream or river. Waterfalls also occur where meltwater drops over the edge of a tabular iceberg or ice shelf. Thai, Central Thai, is the sole official and national language of Thailand and the first language of the Central Thai people and vast majority of Thai Chinese. It is a member of the Tai group of the Kra–Dai language family. Over half of Thai vocabulary is derived from or borrowed from Pali, Sanskrit, Mon and Old Khmer. It is a tonal and analytic language, similar to Chinese and Vietnamese. Lao, sometimes referred to as Laotian, is a Kra–Dai language and the language of the ethnic Lao people. It is spoken in Laos, where it is the official language, as well as northeast Thailand, where it is usually referred to as Isan. Lao serves as a lingua franca among all citizens of Laos, who speak approximately 90 other languages, many of which are unrelated to Lao. Modern Lao (language) is heavily influenced by the Thai language. A vast number of technical terms as well as common usage are adopted directly from Thai. Thai : แม่น้ำโขง, [mɛ̂ː náːm kʰǒːŋ] , or just 'แม่โขง'[mɛ̂ː kʰǒːŋ]. Lao : ແມ່ນ້ຳຂອງ, [mɛː nâːm kʰɔːŋ] , ນ້ຳຂອງ [nâːm kʰɔːŋ] . Tai of Sipsong Panna, น้ำแม่ของ [nâːm mɛː kʰɔ̌ːŋ] , น้ำของ [nâːm kʰɔ̌ːŋ] . Burmese : မဲခေါင်မြစ်, IPA: [mɛ́ɡàʊɴ mjɪ̰ʔ] . Shan :ၼမ်ႉၶွင် [nâm.kʰɔ̌ŋ] or ၼမ်ႉမႄႈၶွင် [nâm.mɛ.kʰɔ̌ŋ] . Khmer : មេគង្គMékôngk [meekoŋ] , ទន្លេមេគង្គTônlé Mékôngk [tʊənlee meekoŋ] . Vietnamese : Sông Mê Kông (IPA: [ʂə̄wŋm mē kə̄wŋm] ); Sông Cửu Long (Nine Dragons River [ʂə̄wŋm kɨ̂w lāwŋm] ). The Burmese language is the Sino-Tibetan language spoken in Myanmar where it is an official language and the language of the Bamar people, the country's principal ethnic group. Although the Constitution of Myanmar officially recognizes the English name of the language as the Myanmar language, most English speakers continue to refer to the language as Burmese, after Burma, the older name for Myanmar. In 2007, it was spoken as a first language by 33 million, primarily the Bamar (Burman) people and related ethnic groups, and as a second language by 10 million, particularly ethnic minorities in Myanmar and neighboring countries. The Shan language, Shan spoken: ၵႂၢမ်းတႆး, pronounced [kwáːm táj](listen)), or ၽႃႇသႃႇတႆး, pronounced [pʰàːsʰàː táj]; Burmese: ရှမ်းဘာသာ, pronounced [ʃáɴ bàðà]; Thai: ภาษาไทใหญ่, pronounced [pʰāː.sǎː.tʰāj.jàj]) is the native language of the Shan people and is mostly spoken in Shan State, Burma. It is also spoken in pockets of Kachin State in Burma, in northern Thailand, and decreasingly in Assam. Shan is a member of the Tai–Kadai language family, and is related to Thai. It has five tones, which do not correspond exactly to Thai tones, plus a "sixth tone" used for emphasis. It is called Tai Yai, or Tai Long in the Tai languages. Tibetan : རྫ་ཆུ་, Wylie : rDza chu, ZYPY : Za qu. Chinese: 扎曲 ; Zā Qū. The SASM/GNC/SRC romanization of Tibetan, commonly known as Tibetan pinyin, is the official transcription system for the Tibetan language in the People's Republic of China for personal names and place names. It is based on the Lhasa dialect of Standard Tibetan and reflects the pronunciation except that it does not mark tone. It is used within China as an alternative to the Wylie transliteration for writing Tibetan in the Latin script within academic circles; Wylie transliteration is more commonly used. 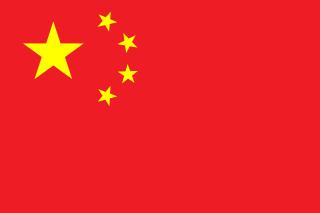 Chinese: simplified Chinese : 澜沧江 ; traditional Chinese :瀾滄江; pinyin :Láncāng Jiāng (from the old name of Lao kingdom Lan Xang). ទន្លេធំTônlé Thum [tʊənlee tʰom] ('Great River'). The Mekong rises as the Za Qu and soon becomes known as the Lancang (Lantsang) in the "Three Rivers Source Area" on the Tibetan Plateau in the Sanjiangyuan National Nature Reserve; the reserve protects the headwaters of, from north to south, the Yellow (Huang He), the Yangtze, and the Mekong Rivers. It flows through the Tibetan Autonomous Region and then southeast into Yunnan Province, and then the Three Parallel Rivers Area in the Hengduan Mountains, along with the Yangtze to its east and the Salween River (Nujiang in Chinese) to its west. Khon Pi Long is a series of rapids along a 1.6-kilometre section of the Mekong River dividing Chiang Rai and Bokeo Province in Laos. The name of the rapids means "where the ghost lost its way". It then turns east into the interior of Laos, flowing first east and then south for some 400 kilometres (250 mi) before meeting the border with Thailand again. Once more, it defines the Laos-Thailand border for some 850 kilometres (530 mi) as it flows first east, passing the capital of Laos, Vientiane, then turns south. A second time, the river leaves the border and flows east into Laos soon passing the city of Pakse. Thereafter, it turns and runs more or less directly south, crossing into Cambodia. The commercially valuable fish species in the Mekong are generally divided between "black fish", which inhabit low oxygen, slow moving, shallow waters, and "white fish", which inhabit well oxygenated, fast moving, deeper waters. People living within the Mekong River system generate many other sources of food and income from what are often termed "other aquatic animals" (OAAs) such as freshwater crabs, shrimp, snakes, turtles, and frogs. OAAs account for about 20 percent of the total Mekong catch. When fisheries are discussed, catches are typically divided between the wild capture fishery (i.e., fish and other aquatic animals caught in their natural habitat), and aquaculture (fish reared under controlled conditions). Wild capture fisheries play the most important role in supporting livelihoods. Wild capture fisheries are largely open access fisheries, which poor rural people can access for food and income. The Mekong Basin has one of the world's largest and most productive inland fisheries. An estimated two million tonnes of fish are landed a year, in addition to almost 500,000 tonnes of other aquatic animals. Aquaculture yields about two million tonnes of fish a year. Hence, the lower Mekong basin yields about 4.5 million tonnes of fish and aquatic products annually. The total economic value of the fishery is between US$3.9 and US$7 billion a year. Wild capture fisheries alone have been valued at US$2 billion a year. This value increases considerably when the multiplier effect is included, but estimates vary widely. For thousands of years the Mekong River has been an important conduit for people and goods between the many towns on its banks. Traditional forms of trade in small boats linking communities continue today, however the river is also becoming an important link in international trade routes, connecting the six Mekong countries to each other, and also to the rest of the world. The Mekong is still a wild river and navigation conditions vary greatly along its length. Broadly, navigation of the river is divided between upper and lower Mekong, with the "upper" part of the river defined as the stretch north of the Khone Falls in southern Laos and the "lower" part as the stretch below these falls. The elevation of the Tibetan Plateau during the Tertiary period was an important factor in the genesis of the south-west monsoon,  which is the dominant climatic control influencing the hydrology of the Mekong Basin. Understanding the nature and timing of the elevation of Tibet (and the Central Highlands of Vietnam) therefore helps explain the provenance of sediment reaching the delta and the Tonle Sap Great Lake today. Studies of the provenance of sediments in the Mekong delta reveal a major switch in the source of sediments about eight million years ago (Ma). From 36 to 8 Ma the bulk (76 percent) of the sediments deposited in the delta came from erosion of the bedrock in the Three Rivers Area. From 8 Ma to the present, however, the contribution from the Three Rivers Area fell to 40 percent, while that from the Central Highlands rose from 11 to 51 percent. One of the most striking conclusions of provenance studies is the small contribution of sediment from the other parts of the Mekong basin, notably the Khorat Plateau, the uplands of northern Laos and northern Thailand, and the mountain ranges south of the Three Rivers area. The last glacial period came to an abrupt end about 19,000 years ago (19 ka) when sea levels rose rapidly, reaching a maximum of about 4.5 m above present levels in the early Holocene about 8 ka. At this time the shoreline of the South China Sea almost reached Phnom Penh and cores recovered from near Angkor Borei contained sediments deposited under the influence of tides, and salt marsh and mangrove swamp deposits. Sediments deposited in the Tonle Sap Great Lake about this time (7.9–7.3 ka) also show indications of marine influence, suggesting a connection to the South China Sea. Although the hydraulic relationships between the Mekong and the Tonle Sap Great Lake systems during the Holocene are not well understood, it is clear that between 9,000 and 7,500 years ago the confluence of the Tonle Sap and the Mekong was in proximity to the South China Sea. The present river morphology of the Mekong Delta developed over the last 6,000 years. During this period, the delta advanced 200 km over the continental shelf of the South China Sea, covering an area of more than 62,500 km2. From 5.3 to 3.5 ka the delta advanced across a broad embayment formed between higher ground near the Cambodian border and uplands north of Ho Chi Minh City. During this phase of its development the delta was sheltered from the wave action of long-shore currents and was constructed largely through fluvial and tidal processes. At this time the delta was advancing at a rate of 17–18 m per year. After 3.5 ka, however, the delta had built out beyond the embayment and became subject to wave action and marine currents. These deflected deposition south-eastwards in the direction of the Cà Mau Peninsula, which is one of the most recent features of the delta. For much of its length the Mekong flows through bedrock channels, i.e., channels that are confined or constrained by bedrock or old alluvium in the bed and riverbanks. Geomorphologic features normally associated with the alluvial stretches of mature rivers, such as meanders, oxbow lakes, cut-offs, and extensive floodplains are restricted to a short stretch of the mainstream around Vientiane and downstream of Kratie where the river develops alluvial channels that are free of control exerted by the underlying bedrock. The Thai–Lao Friendship Bridge (Thai : สะพานมิตรภาพ ไทย-ลาว; RTGS: saphan mittra phap thai-lao) connects Nong Khai city with Vientiane in Laos. The 1,170-metre-long (3,840 ft) bridge opened on 8 April 1994. It has two 3.5-metre-wide (11 ft) lanes with a single railway line in the middle. On 20 March 2004, the Thai and Lao governments agreed to extend the railway to Tha Nalaeng in Laos. This extension has since been completed. The Fourth Thai–Lao Friendship Bridge opened to traffic on 11 December 2013. It links Chiang Rai Province, Thailand with Ban Houayxay, Laos. There is one bridge over the Mekong entirely within Laos. Unlike the Friendship Bridges, it is not a border crossing. It is at Pakse in Champasak Province. It is 1,380 meters (4,528 ft) long, and was completed in 2000. 15°6′19.95″N105°48′49.51″E﻿ / ﻿15.1055417°N 105.8137528°E﻿ / 15.1055417; 105.8137528﻿ (Pakxe) ). Cambodia is a country in mainland Southeast Asia, bordering Thailand, Laos, Vietnam, the Gulf of Thailand and covers a total area of 181,035 km2 (69,898 sq mi). The country is situated in its entirety inside the tropical Indomalayan ecozone and the Indochina Time zone (ICT). Vietnam is located on the eastern margin of the Indochinese peninsula and occupies about 331,211.6 square kilometers, of which about 25% was under cultivation in 1987. 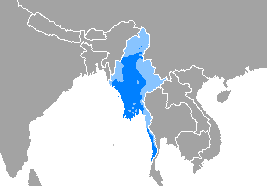 It borders the Gulf of Thailand, Gulf of Tonkin, and Pacific Ocean, along with China, Laos, and Cambodia. The S-shaped country has a north-to-south distance of 1,650 km (1,030 mi) and is about 50 km (31 mi) wide at the narrowest point. With a coastline of 3,260 km (2,030 mi), excluding islands, Vietnam claims 12 nautical miles as the limit of its territorial waters, an additional 12 nautical miles as a contiguous customs and security zone, and 200 nautical miles as an exclusive economic zone. Tonlé Sap refers to a seasonally inundated freshwater lake, the Tonlé Sap Lake and an attached river, the 120 km (75 mi) long Tonlé Sap River, that connects the lake to the Mekong River. They form the central part of a complex hydrological system, in the 12,876 km2 (4,971 sq mi) Cambodian floodplain covered with a mosaic of natural and agricultural habitats that the Mekong replenishes with water and sediments annually. The central plain formation is the result of millions of years of Mekong alluvial deposition and discharge. From a geological perspective, the Tonlé Sap Lake and Tonlé Sap River are a current freeze-frame representation of the slowly but continuously shifting lower Mekong basin. Annual fluctuation of the Mekong's water volume, supplemented by the Asian monsoon regime, causes a unique flow reversal of the Tonle Sap River. Khmer cuisine or, more generally, Cambodian cuisine, is the traditional cuisine of the people of Cambodia. Average meals typically consist of more than one dish and ideally contrast flavours, textures and temperatures within the meal using plenty of herbs, leaves, pickled vegetables, dipping sauces, edible flowers and other garnishes and condiments. 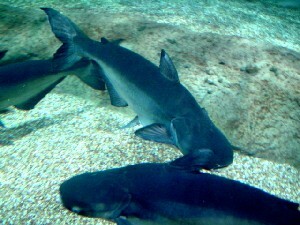 The Mekong giant catfish, is a large, critically endangered species of catfish in the shark catfish family (Pangasiidae), native to the Mekong basin in Southeast Asia and adjacent China. In Thai folklore, this fish is regarded with reverence, and special rituals are followed and offerings are made before fishing it. The Nam Ngum Dam is a hydroelectric dam on the Nam Ngum River, a major tributary of the Mekong River in Laos. It was the first hydropower dam built in the Lao PDR. Nam Ngum is a 354 km long river in Laos. It is a major tributary of the Mekong River. Thailand has 25 river basins with 254 sub-basins. Rainwater is one of the most important sources of water. Thailand's water resource per capita is less than that of other countries in the region. Natural resources are materials that occur in a natural form within environments. These can be classified as either biotic or abiotic on the basis of their origin. The landmass and the territorial waters of Cambodia contain a rather moderate amount, array and variety of resources. Apart from water, abiotic resources, such as minerals are generally rare. Still, advanced geo-scientific technologies have produced remarkable results and re-assessments in recent years, such as the localization of offshore oil and gas depots in the Gulf of Thailand. Cambodia, on the other hand possesses a relatively wide range of biotic resources, in particular timber, forest products, rare plants and a fauna of great diversity. The estimated hydropower potential of the lower Mekong Basin is 30,000 MW, while that of the upper Mekong Basin is 28,930 MW. In the lower Mekong, more than 3,235 MW has been realized via facilities built largely over the past ten years, while projects under construction will represent an additional 3,209 MW. An additional 134 projects are planned for the lower Mekong, which will maximize the river's hydropower generating capacity. The single most significant impact—both now and in the future—on the use of water and its management in the Mekong Region is hydropower. Stung Sen Dam is a proposed multipurpose dam to be located on the Stung Sen River. The river originates in Preah Vihear and flows to the Tonlé Sap Lake in Kompong Thom, southeast of Phnom Rovieng, Cambodia. Under MoU study project and Feasibility Study by Korean company. The large reservoir would submerge Kompong Putrea. Exact data for reservoir size and number of displaced people is not available, nor is any information on the importance of the Stung Sen's flow to the Tonle Sap Lake or fisheries. The Stung Treng Dam is a proposed hydroelectric dam on the Mekong River in Stung Treng Province, Cambodia. It would be located on the mainstream of the Lower Mekong River. The project is controversial for several reasons, including its possible impact on the fisheries, as well as other ecological and environmental factors. Chinit River is a river of Cambodia. Located in Kampong Thom Province, it is a major tributary of the Tonlé Sap Lake, which joins the Tonlé Sap River at the downstream end in the larger Mekong basin. Somewhat unusually the river is looped back into the same river system, which accounts for its length of 264 kilometres (164 mi), leaving Tonlé Sap lake and entering its river again downstream. The prehistoric archaeological site of Samrong Sen is located on the river bank. Water resource projects, commencing in 1971 and in 2003, have had various measures of success. The river is an important trade route. The Xayaburi Dam is a hydroelectric dam on the Lower Mekong River approximately 30 kilometres (19 mi) east of Xayaburi (Sainyabuli) town in northern Laos. In 2019, commercial operation is scheduled to start. The main purpose of the dam is to produce hydroelectric power. The project is surrounded in controversy due to complaints from downstream riparians and environmentalists. Preliminary construction began in early-2012, but work on the dam itself was suspended shortly thereafter due to complaints from Cambodia and Vietnam downstream. After making modifications to the dam's design, Laos plans to start full construction with a ceremony on 7 November 2012. The Xayaburi Dam is the first of the 11 dams planned on the lower Mekong. This page describes energy and electricity production, consumption and import in Laos. Paralaubuca typus is a species of freshwater ray-finned fish from the carp and minnow family Cyprinidae from south-east Asia. It is found in Thailand in the basins of the Chao Phraya, Tapi, Mekong and Mae Klong and in the Mekong on Laos and Cambodia, as well as Vietnam where it is also found in the La Ngà River. It is one of the most abundant fish species in the lower Mekong. ↑ "Ramsar List". Ramsar.org. Archived from the original on 9 April 2013. Retrieved 12 April 2013. 1 2 S. Liu; P. Lu; D. Liu; P. Jin; W. Wang (2009). "Pinpointing source and measuring the lengths of the principal rivers of the world". International Journal of Digital Earth. 2 (1): 80–87. doi:10.1080/17538940902746082. 1 2 3 4 5 6 7 8 9 10 11 12 13 14 15 16 17 18 19 20 21 "State of the Basin Report, 2010" (PDF). Mekong River Commission. Vientiane. 2010. ↑ Wangkiat, Paritta (15 January 2017). "Against the flow". Bangkok Post (Spectrum). Retrieved 3 May 2018. 1 2 3 4 5 6 7 8 9 10 11 12 13 14 15 16 17 18 19 20 21 22 23 24 25 26 27 28 Mekong River Commission (2005). "Overview of the Hydrology of the Mekong Basin" (PDF). MRC, Vientiane, Laos. ↑ G. Lacombe; A. Pierret; C. T. Hoanh; O. Sengtaheuanghoung; A. Noble (2010). "Conflict, migration and land-cover changes in Indochina: a hydrological assessment". Ecohydrology. 3 (4): 382–391. doi:10.1002/eco.166. ↑ Michael Buckley (30 March 2015). "The Price of Damming Tibet's Rivers". The New York Times. New Delhi. p. A25. Archived from the original on 31 March 2015. Retrieved 1 April 2015. Other plans call for diversion of water from the Brahmaputra, Salween and Mekong — all rivers that cross national boundaries. ↑ Yeophantong, Pichamon (2014). "China's Lancang Dam Cascade and Transnational Activism in the Mekong Region: Who's Got the Power?". Asian Survey. 54 (4): 700–724. doi:10.1525/as.2014.54.4.700. ↑ "Requiem for a river". The Economist. Retrieved 18 February 2016. 1 2 Suksamran, Nauvarat (9 January 2017). "Locals slam Mekong blasting plan". Bangkok Post. Retrieved 9 January 2017. ↑ "Spare the Mekong" (Editorial). Bangkok Post. 30 December 2016. Retrieved 30 December 2016. ↑ K. G. Hortle (2009). "Fishes of the Mekong – how many species are there?". "Catch and Culture". Mekong River Commission. Archived from the original on 30 July 2012. ↑ N. Gephart; G. Blate; C. McQuistan; C. Thompson (2010). "New Blood: Greater Mekong New Species Discoveries, 2009" (PDF). WWF. ↑ "163 new species, including 'Klingon Newt', discovered". Fox News. 20 December 2016. Retrieved 20 December 2016. 1 2 3 "River of Giants: Giant Fish of the Mekong" (PDF). WWF Greater Mekong Program. 2012. ↑ Froese, Rainer, and Daniel Pauly, eds. (2017). Species of Probarbus in FishBase . February 2017 version. ↑ Last, P.R. ; Compagno, L.J.V. (1999). "Myliobatiformes: Dasyatidae". In Carpenter, K.E. ; Niem, V.H. (eds.). FAO identification guide for fishery purposes. The living marine resources of the Western Central Pacific. Food and Agriculture Organization of the United Nations. pp. 1479–1505. ISBN 92-5-104302-7. ↑ Ryan, Gerard Edward; Dove, Verne; Trujillo, Fernando; Doherty, Paul F. (2011). "Irrawaddy dolphin demography in the Mekong River: an application of mark–resight models". Ecosphere. 2 (5): art58. doi:10.1890/ES10-00171.1. 1 2 3 International Center for Environmental Management (2010). "Strategic Environmental Assessment (SEA) of hydropower on the Mekong mainstream" (PDF). Mekong River Commission. ↑ J.W. Ferguson; M. Healey; P. Dugan; C. Barlow (2011). "Potential Effects of Dams on Migratory Fish in the Mekong River: Lessons from the Fraser and Columbia Rivers". Environmental Management . 47 (1): 141–159. Bibcode:2011EnMan..47..141F. doi:10.1007/s00267-010-9563-6. ↑ J. Valbo-Jørgensen, D. Coates & K.G. Hortle (2009). "Fish diversity in the Mekong River Basin.". In I.C. Campbell (ed.). The Mekong: Biophysical Environment of an International River Basin. London: Elsevier Publishers. pp. 161–196. ISBN 978-0123740267. 1 2 3 E. Baran & C. Myschowoda (2009). "Dams and fisheries in the Mekong Basin". Aquatic Ecosystem Health and Management . 12 (3): 227–234. doi:10.1080/14634980903149902. 1 2 3 4 5 E. Baran & B. Ratner (2007). "The Don Sahong Dam and Mekong Fisheries" (PDF). Science Brief. World Fish Center. ↑ K. G. Hortle (2007). "Consumption and the yield of fish and other aquatic animals from the Lower Mekong Basin" (PDF). MRC Technical Paper No. 16. Mekong River Commission. 1 2 S. Bush (2007). "Give a man a fish..." Contextualising Living Aquatic Resources Development in the Lower Mekong Basin" (PDF). AMRC Working Papers 8. Australian Mekong Resource Centre, University Of Sydney. 1 2 3 R. Friend & D. J. H. Blake (2009). "Negotiating trade-offs in water resources development in the Mekong Basin: implications for fisheries and fishery-based livelihoods". Water Policy . 11 (S1): 13–30. doi:10.2166/wp.2009.001. ↑ I. G. Baird (2011). "The Don Sahong Dam". Critical Asian Studies . 43 (2): 211–235. doi:10.1080/14672715.2011.570567. ↑ M. Clark; L. Schoenbohm; L. Royden; K. Whipple; B. Burchfiel; W. Zhang; W. Tang; E. Wang; L. Chen (2004). "Surface uplift, tectonics, and erosion of eastern Tibet from large-scale drainage patterns". Tectonics . 23 (TC1006): 227–234. Bibcode:2004Tecto..23.1006C. doi:10.1029/2002TC001402. ↑ C. Twidale (2004). "River patterns and their meanings". Earth-Science Reviews . 67 (3–4): 159–218. Bibcode:2004ESRv...67..159T. doi:10.1016/j.earscirev.2004.03.001. ↑ S. K. Tandon & R. Sinha (2007). "Geology of large river systems". In A. Gupta (ed.). Large rivers: geomorphology and management. London: John Wiley & Sons. pp. 7–28. ISBN 978-0-470-84987-3. ↑ P. D. Clift & A. R. Plumb (2008). The Asian monsoon: causes, history, and effects. Cambridge, UK: Cambridge University Press. ISBN 9780521847995. ↑ P. D. Clift; A. Carter; I. H. Campbell; M. Pringle; V. Nguyen; C. Allen; C. M. Allen; K. V. Hodges; T. T Mai (2006). "Thermochronology of mineral grains in the Red and Mekong Rivers, Viet Nam: Provenance and exhumation implications for Southeast Asia". Geochemisty, Geophysics, Geosystems . 7 (10): 1–28. Bibcode:2006GGG.....710005C. doi:10.1029/2006GC001336. ↑ P. D. Clift, G. Layne & J. Blusztajn (2004). "Marine sedimentary evidence for monsoon strengthening, Tibetan uplift, and drainage evolution in East Asia". Geophysical Monograph Series . 149 (2004): 255–282. Bibcode:2004GMS...149..255C. doi:10.1029/149GM14. 1 2 T. Tamura; Y. Saito; S. Sotham; B. Bunnarin; K. Meng; S. Im; S. Choup; F. Akiba (2009). "Initiation of the Mekong River Delta at 8 ka: Evidence from the sedimentary succession in the Cambodian lowland". Quaternary Science Reviews . 28 (3–4): 327–344. Bibcode:2009QSRv...28..327T. doi:10.1016/j.quascirev.2008.10.010. ↑ D. Penny (2006). "The Holocene history and development of the Tonle Sap, Cambodia". Quaternary Science Reviews . 25 (3–4): 310–322. Bibcode:2006QSRv...25..310P. doi:10.1016/j.quascirev.2005.03.012. ↑ T. K. Ta; V. L. Nguyen; M. Tateishi; I. Kobayashi; S. Tanabe; Y. Saito (2002). "Holocene delta evolution and sediment discharge of the Mekong River, Southern Viet Nam". Quaternary Science Reviews . 21 (16–17): 1807–1819. Bibcode:2002QSRv...21.1807T. doi:10.1016/S0277-3791(02)00007-0. ↑ C. H. Fenton, P. Charusiri & S. H. Wood (2003). "Recent paleoseismic investigations in northern and western Thailand". Annals of Geophysics . 46 (5): 957–981. ↑ Franzen, Harald (20 July 2017). "There are 8.3 billion tons of plastic in the world". Deutsche Welle. Retrieved 17 April 2018. ↑ Franzen, Harald (30 November 2017). "Almost all plastic in the ocean comes from just 10 rivers". Deutsche Welle. Retrieved 17 April 2018. 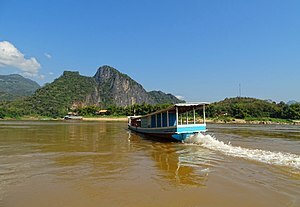 Wikimedia Commons has media related to Mekong .